Mayor of Leichhardt casts vote. Five times more online votes than anticipated. Residents in New South Wales State Election have revealed a strong preference for voting online – with five times the predicted number of votes cast using the new iVote system. Prior to the weekend election, the NSW Electoral Commission (NSW EC) told iTnews it expected roughly 10,000 votes would be made using the online option - but today it was revealed that the actual figure was over 47,000. 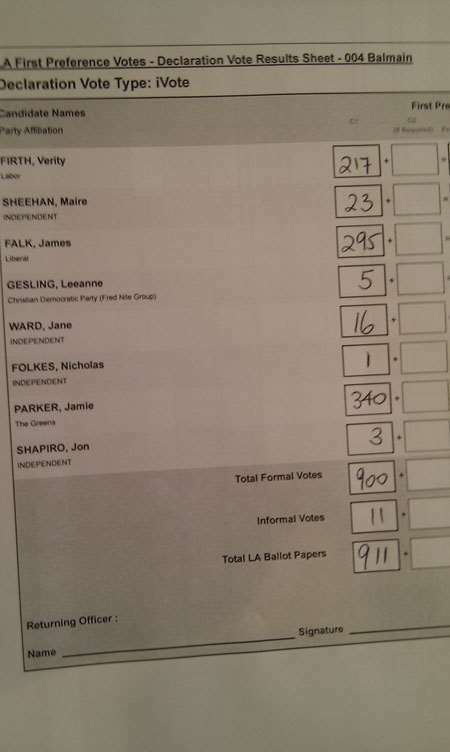 This included 911 iVotes in the hotly contested seat of Balmain, currently a three-horse race between Liberal, Labor and the Greens. Balmain is the closest contested electorate in the election and its voters used iVote at proportionately almost twice the average per electorate. In that sense, internet votes may tip the balance in deciding who wins the seat. Will iVotes decide the crucial seat of Balmain? Ian Brightwell, CIO at NSW EC told iTnews that while the iVote system was developed to help voters who are blind, vision impaired, with other disabilities or illiterate, over 90 percent of registrations were from voters who were interstate or overseas on Election Day. Interestingly, votes cast online are actually printed out and sent by courier to the NSW EC office to be counted physically. EC staff speaking to iTnews on condition of anonymity said the online votes were nonetheless faster to count and more accurate than hand-filled votes. Feedback to the NSW EC regarding iVote has been generally positive but according to comments in the iTunes Store the much publicised NSW EC iPhone App appears to have experienced errors in search queries for postcodes and suburbs.